A team of 14 current and ex-military service personnel, some with severe physical and mental injuries, have completed the Carta Rallye in Morocco, an extreme 2,000km challenge that took place in the Sahara Desert, all in a trio of Dacia Dusters. Over seven days between the 31st March and 6th of April, the Future Terrain team, a charity that supports career transition and rehabilitation mainly for those with physical and mental injuries, took on giant sand dunes, rocky roads, flooded tracks and harsh terrain – in Britain’s most affordable 4x4. The journey to Morocco was also just as arduous, with the team driving more than 2,000 miles from the UK and then all the way back home again. While several specially-built rally cars costing hundreds of thousands were getting stuck overnight in the desert, the shockingly affordable Dusters made it back to the camp each evening after ten-hours of driving. The Dusters were near-standard, with little to no modifications made to them other than some racing seats, roll bars and all-terrain tyres. The team took part in the GPS Challenge, a timed navigation-based event. Not just about podium results, the aim of the event for the charity was to build confidence and skills in the group that competed and challenge them to redefine themselves. However, the team aimed high and achieved second and third place finishes in some legs. While the team were expecting a dustbowl, they arrived following highly unusual heavy rain and the first day of the rally saw the cars being driven through a far wetter environment than predicted, meaning that the challenge was even greater as they had to improvise and think even more carefully about the routes they were taking through the desert. 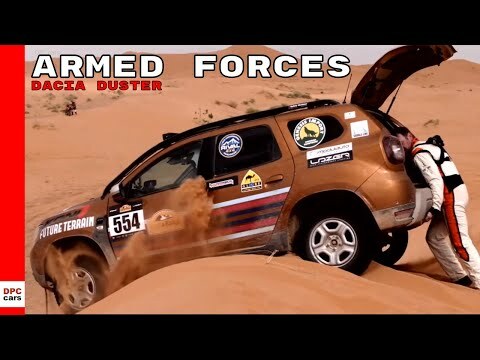 The team of volunteers from Future Terrain now prepare themselves for the next challenges - racing the Dacia Dusters in the British Cross-Country Championship rally series as well as other events in the UK. The All-New Duster starts at just £9,995 with the 4x4 version priced from just £13,710 OTR. It carries over the same off-roading credentials that helped make the previous model such a success with a high ground clearance of 210mm, approach and departure angles of 30 and 33 degrees respectively as well as Hill Descent Control and Hill Start Assist. Also as standard on 4x4 versions is a 4x4 monitor that incorporates a compass and notifies the driver of the vehicle’s angle in real time.